The aim of CYGNUS international collaboration is to develop an underground distributed Galactic Nuclear Recoil Observatory to search and identify clear Dark Matter (DM) signature and detect Coherent Neutrino Scattering (CNS) form the Sun, exploring directionality and particle identification. The base of distributed detectors of the collaboration, in which Italy is participating with the CYGNO and INITIUM projects, is to develop large Time Projection Chambers (TPC) for high precision tracking of low energy O(keV) nuclear recoils. Alike, the signature of the very low energy solar neutrinos should be modulated by the day night effect avoiding the background radioactive noise. 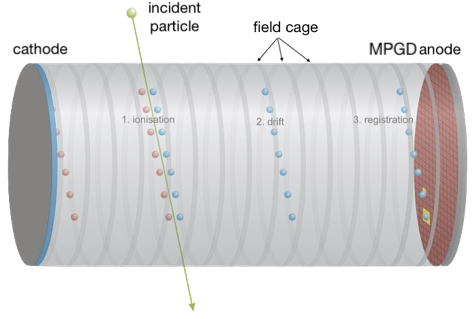 In the today scenario of Dark Matter detectors, dominated by large mass liquid detectors with a MaV scale threshold and small mass solid doctors with a eV scale threshold, the large TPC gas detectors offer a medium range energy threshold O(keV) and can exploit their ability to identify the directionality and to the particle nature increasing the ability to avoid the background. Our group is working at the construction of a 1 cubic metter demonstrator based on Micro Gas Pattern Detector (MGPD) optically read by means of a sCMOS low noise and high granularity sensor. The CYGNO project aims at demonstrating the feasibility of the TCP approach with a He:CF4 gas mixture at atmospheric pressure. In this framework, an ERC grant was obtained with the INITIUM initiative that intend to exploit the potentiality of negative ions (lower diffusion and fiducialization) by the addition of a small amount of SF6. The projects are foreseen to be hosted at the National Laboratory of Gran Sasso (LNGS), in Italy and are funded by the National Institute for Nuclear Physics (INFN) and the European Commission.